Rather than give you a spiel about what tiropita is and fake like I know what I'm talking about (as I've done many times in the past), I'll just link to Wikipedia for you here. But I will go ahead and simply mention that just as spanakopita means "spinach pie," tiropita or tyropita means "cheese pie." How creative. When you first bite into these pastries, you'll notice the buttery, flaky crust, but the filling really zings the tongue with a super Greek-ish cheese flavor. 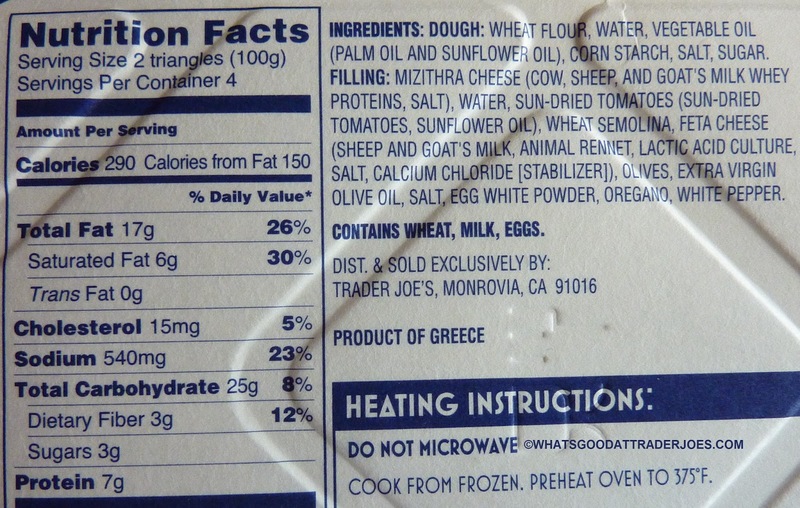 At first, I thought it was all feta, but the first cheese mentioned in the ingredients is "mizithra." It's made with cow, sheep, and goat's milk so that none of the farm animals feel left out. What? No pig's milk? The taste of the tangy cheeses overpowers most of the tomato flavor, IMHO. But if you pay attention, there's definitely a touch of sun-dried tomato up in the mix. They go together pretty well. 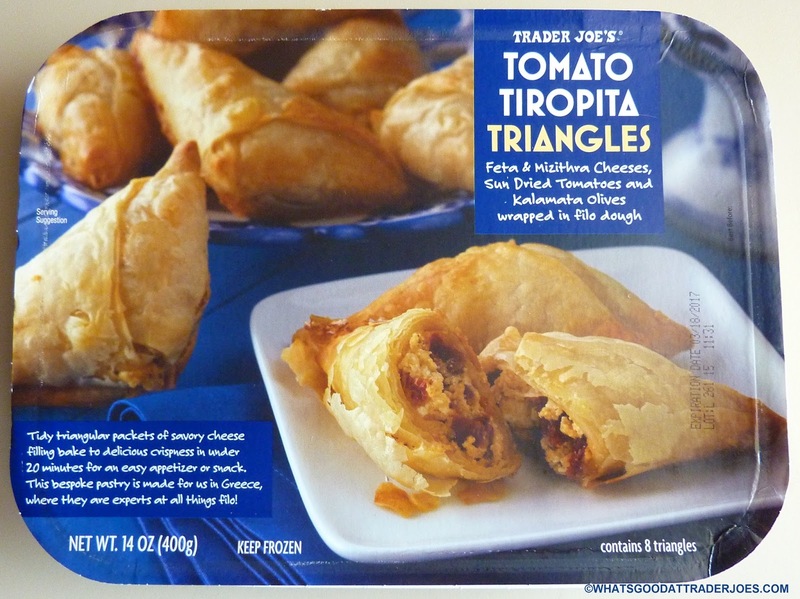 I was thinking they should have called these "Mizithra Tiropita Triangles," because the cheese flavor is so dominant, but then again, mizithra is a type of cheese and tiropita means "cheese pie," so it would not only be redundant, but you'd lose that nice alliteration in the title of the product. And technically, since these are three-dimensional objects, shouldn't they be called "prisms" or "polyhedrons"? I guess not, since the sides of the prisms aren't perfect planes. So basically, just forget about this whole paragraph. Sonia? 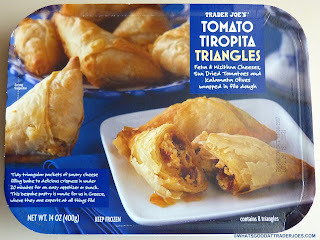 She liked these even more than I did, and she also made the initial assumption that the primary cheese flavor was feta. She claims she could taste olives. 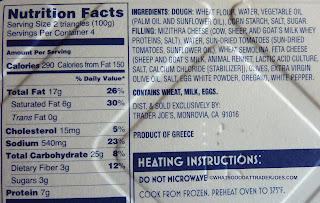 And there are definitely some olives and olive oil in there, but my taste buds weren't keen enough to pick them out without looking at the ingredients...or, you know, the front of the packaging where it explicitly states there are Kalamata olives in the product. 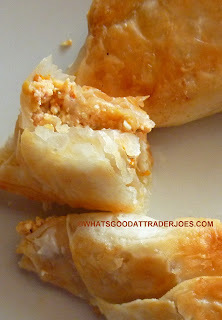 She also enjoyed the flaky crust but thought it was a bit too oily. In all honesty, that might have been my fault since I used a little oil in the pan when I baked them. I was a bad boy and did not follow the instructions exactly. But they still came out good enough for Sonia to give them a four. I'll say...three and a half. It would be a great party app. Just pop in oven and serve. Excellent idea if you are too tired to cook. Is the package oven ready? I noticed some unique voids in the package. Yes. The package is "ovenable." Its ridiculously difficult to milk a sow. Also the yield is low and resulting milk is gamy in flavour. There's a reason it's not popular... Cause you know, if it was easily done, and made a good profit, companies would sell it! I definitely taste a heavy olive flavor, which is a shame because it isn't my favorite.